So you know by now this year I'm focusing Mondays' posts on discovering our worth in Christ. To get started, I thought we should first go back to the very beginning. To the very moment God decided to create man and woman. Referenced above is a Scripture from Genesis that you’ve either read several times yourself or, quite possibly, heard at one time in your life. There are three things I want to draw your attention to within those few words. First is that we have been created in God’s very own image. Nothing else on this planet was a “chip off the old block” to put it lightly. Whether you’re a parent or not, you know this to be true: every parent believes their children are the most beautiful on the planet. Your Father believes no less. He created you to mirror him, and you are the most beautiful creation he could imagine, nothing else compares. 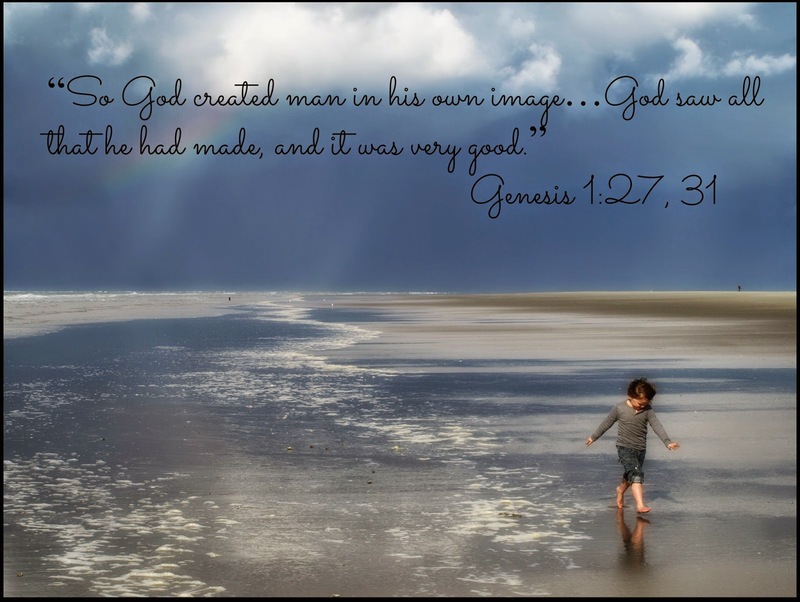 Second, for every creation prior to this one, God noted it was “good.” It was only when he created man that he noted it was “very good”. If we look up the word “very” in Hebrew, it’s “meod” which translates to “muchness, force, abundance”. God wasn’t simply saying, “Pretty good there.” No, with force and conviction in his voice, he proclaimed that this creation was very good. Ah…but what does that word “good” translate to? That’s my third point and the one most exciting. In Hebrew, the word God chose to use was “towb”. Translated, that one little word means “BEAUTIFUL”. Lord, help us to discover our worth in you. Not only that, but our beauty. Oh how we want to be beautiful and sometimes in looking for that, we wind up places we were never meant to be. Hold our hearts in your hands and whisper to each one of us how unique and beautiful we are in you. Think of all the massive beauty in creation around you. Find a picture of the most beautiful thing you have ever seen (mental or physical picture). A rosy sunset. Waves crashing on a white, sandy beach. A delicate flower. Whatever it is, lock onto it. Now, let His truth sink in. In his eyes, you are meod towb…abundantly more beautiful than anything else on this planet. Each and every time you proclaim the beauty of creation around you, I pray you hear his voice proclaiming your true beauty even louder. I never noticed 'very' before. What a great post. When I opened the curtains this morning, God was splashing a beautiful sunrise across the sky, I kinda wish I'd read your blog first.